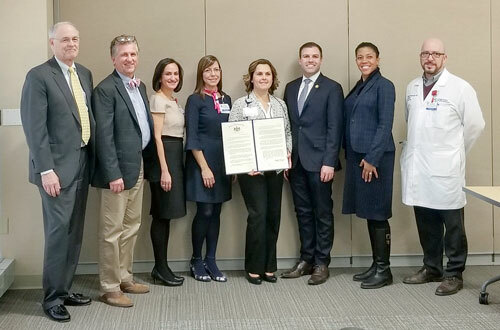 Rep. Ryan Mackenzie (R-Lehigh/Berks) joined a group of health care professionals at the Lehigh Valley Health Network to announce Jan. 23 as Maternal Health Awareness Day in Pennsylvania. House Resolution 27, which was authored by Mackenzie, designates Jan. 23, 2019, as a day to highlight the importance of maternal health and encourage women to talk with their doctors about what they can do to ensure the best possible health outcome for them and their babies. Pictured, from left, are Dr. Tom Hutchinson; Dr. Mark Woodland; Dr. Amy Ahnert; Dr. Joanne Quinones; Dr. Amanda Flicker; Mackenzie; Dr. Loren Robinson, PA Department of Health deputy secretary for Health Promotion and Disease Prevention; and Dr. Ronald Freudenberger.